Highlands Ranch Mansion is an historic property with lots of character and beautiful landscaping that is perfect for wedding photography. While not a typical looking ranch, it has 250 acres of property that allows for creativity and options galore when taking photos. An outdoor ceremony can take place on the front lawns or in the back with a gazebo. The front has views towards the mansion and the back views of a rolling grassy field and the foothills to the west. The mansion building itself has many photography opportunities, both inside and out. Since the building was added onto over time, there is a variety of styles, like the castle-like main entrance to the more European-style wood beams. The grand staircases give a luxury feel to the photos that is hard to find in Colorado, but still you can have some mountain views peeking through. Inside there are large rooms for getting ready in and two large ballrooms for the reception, and smaller rooms and large patio for the cocktail hour. 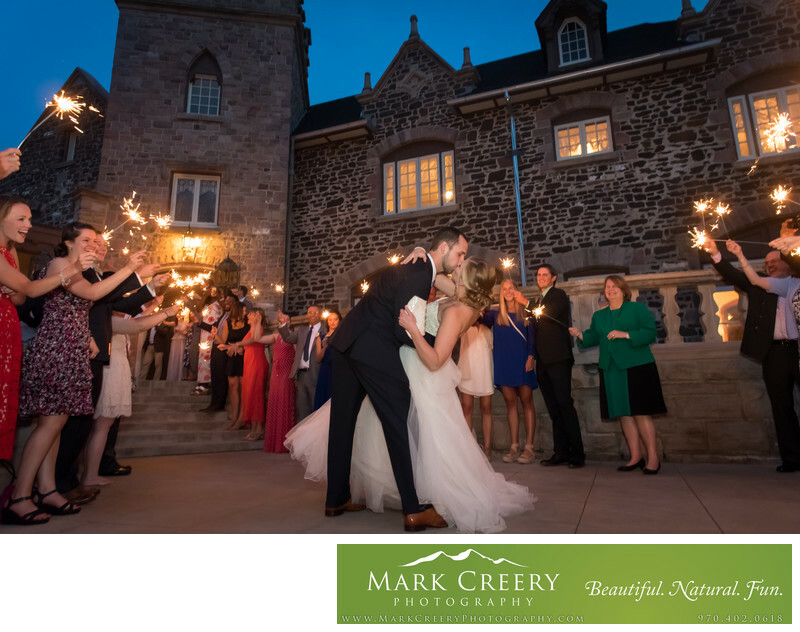 In this photo, the couple did a sparkler exit leaving the reception to their awaiting car to whisk them away. The front staircases are a perfect spot for this as many guests can gather around and there is ample room for the couple to make their way through safely. It was good that the sparkler handlers were prepared with a bucket of water, as one of the bushes was accidentally lit on fire but quickly put out. Location: 9950 E Gateway Drive, Highlands Ranch, CO 80126.